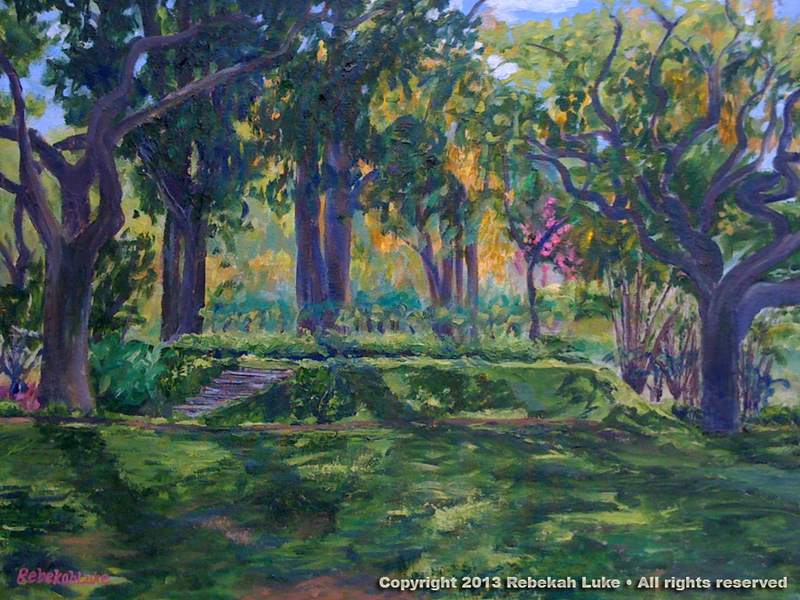 Oil painting en plein air—one of my callings. Hand-dyed tissue paper collage is my newest art medium. I am happy to devote this page to my virtual gallery. Please contact me if you have an interest in a personal showing, in representing me, or if you would like to commission a work. To view my RETROSPECTIVE COLLECTION, please click on the menu tab at the top. My paintings are available for you to see as soon as I have finished making them, including the most recent ones awaiting a varnish coat once the work is completely dry, usually in about three to six months for oils. The prices (in U.S. dollars) include a frame selected by me. The frame adds to the dimensions given below. I have a layaway plan and I accept credit cards. 395.00 Abstract motif of taro corms, stems, and leaves—the staple food of Hawaiians. 500.00 Boats docked on Kaneohe Bay, Oahu, with the Koolau Mountains in the background. 600.00 In Kahalu‘u, O‘ahu, where there is a big statue of Buddha. 250.00 These ironwood trees have lined this carriageway at Kapi‘olani Park in Waikiki for ages. 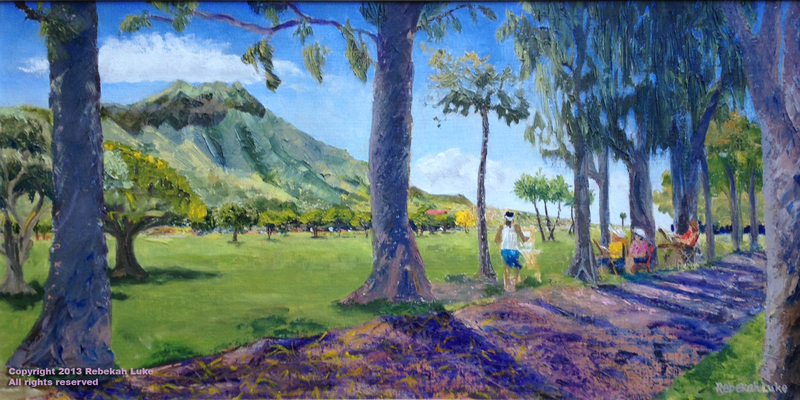 I brought my painting students here to paint Diamond Head en plein air. 20″ x 14″ Giclée repro on Canvas, unframed. Also available on 16″ x 12″ without violet haze. 150.00 This earthen mound is for dancers to hula at Moanalua Gardens, Honolulu. 600.00 After a big rain, the clouds lifted for this awe-inspiring scene. 425.00 These exotic flowers grow outside my kitchen window. 425.00 My alternate title for this one is “Mexican ! Fruit” because of the energetic colors. You are a Renaissance woman. Love your paintings and love to the Kong sisters. We prayed for them before try left on their trip. Would love to be painting with you all. Hello, again! You’re not missing much, as I’m a blogging fool, and I illustrate many of my posts with my photos. It’s true: my first awards were for photography and film. That was pre-digital. Now, my camera of choice is the remarkable iPhone, and my darkroom is Photoshop. The tools have changed, but light, design, and story have not. You might have read I’ve started teaching oil painting. My students get a bonus from what I know about photography. From time to time I’ll report on how that’s progressing and publish some images of that experience. Good idea! Thanks for your support all these years. I love your art. I wanted to express that in this, appropriate, forum. As the proud recipient of one of your photography pieces (which I have cherished much for several years), I wonder … Are there other examples of your work in photography which you could share here? I, for one, would enjoy seeing such works displayed…all of your work is awe-inspiring. I feel that we may be missing something … believing that there is, yet, another artistic angle which your creativity has explored. So, how about it? Any photography to share? Thank you, Tamsen. Nice to “meet” you again. I visited your website, and I’m impressed and inspired by the breadth of your work. The ipu are beautiful. Aren’t we blessed to have our art? I am familiar with native ipu through Momi Greene, another artist. She was among the first of Dr. Bruce Christman’s students at the Bishop Museum to start growing the native ipu again, and she does the Niihau style——dying from the inside out——almost exclusively. Aloha Rebekah…love your work and you are a true inspiration. You can check out my Hawaiiana art gourds, paintings, jewelry, etc at my website tamsenfox.com and you might recognize me from a couple before-Christmas (2011) rehearsals. Mahalo for your wonderful blog and offerings. And the pleasure is mine! All the best for the holidays and always, Bee. Miss you. Cousin, I am honored & privileged to own one of your paintings. I’m glad you stopped by Rebekah’s Studio. Next time you’re on the island, I can take you to those places. Hope it’s soon! 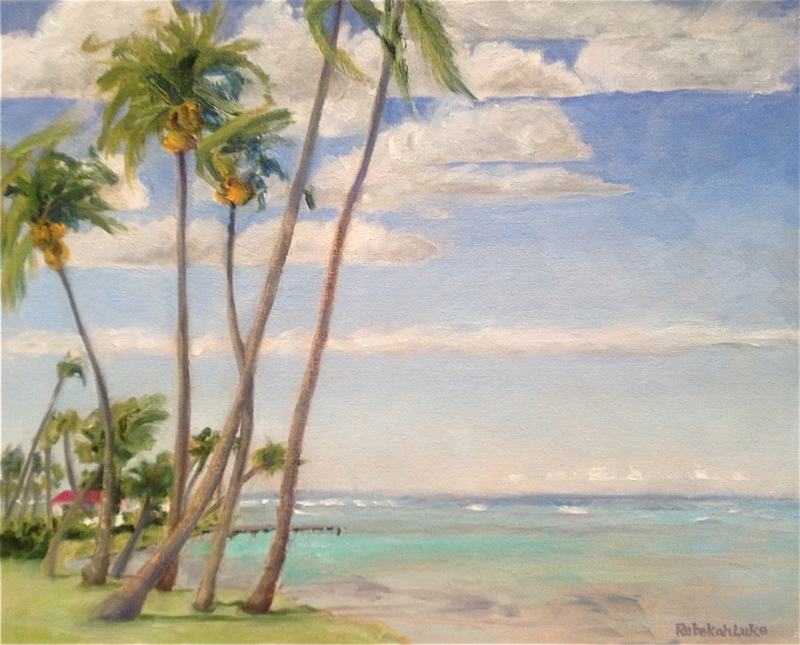 Rebekah, these paintings so much capture the atmosphere of the island as I remember it. I specially love CLOUDS LIFTING OVER LANIHULI and BLUE KOOLAU MOUNTAINS. Look forward to reading more of your blog too……..I’ll be back. Thank you for the compliment! 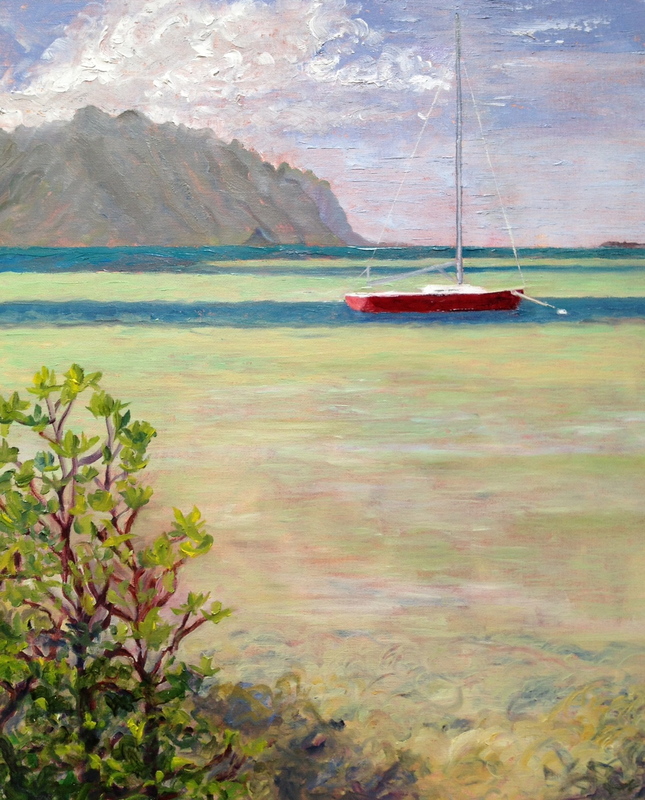 I bet there is a lot of subject matter for a plein air painter in Aotearoa; I have not been there yet but know it has beautiful scenery and people. I am looking forward to seeing you again! Thanks for the compliments! Rebekah, your paintings are so beautiful! What a talent!! Who knew as we were growing up in Wahiawa that I would leave the islands and you would pursue a career in painting. You are truly blessed with a wonderful and loving family and of course your passion for painting. I sincerely hope we can connect when I’m home in Sep. I would love to see you again after all these years and to see your original paintings! Aloha Nui Loa! Mahalo Marie. I hope you are still making art too. 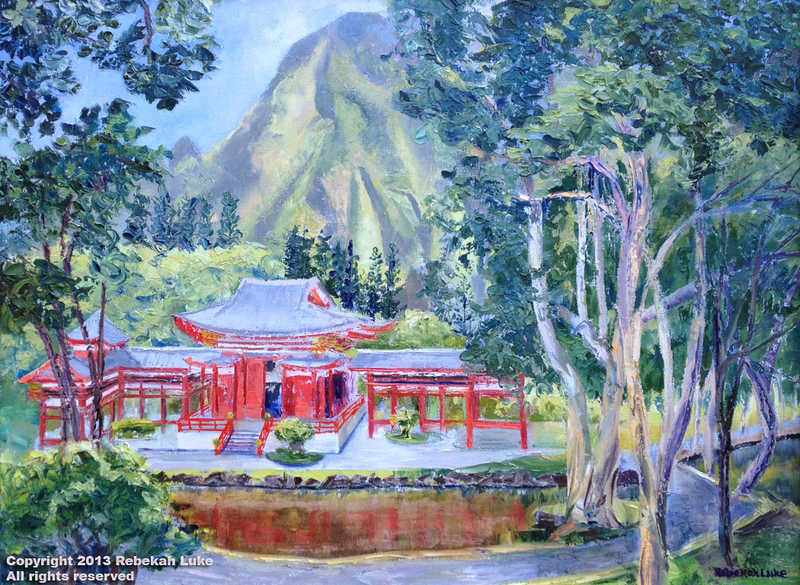 You have captured the essence of Hawaii in both photos and paintings. They are breathtaking!! Keep up the awesome creations! Thursday at Kahana? If I could just clone myself! WordPress was recommended to me, and I love the service! I enjoy writing. I love blogging! It’s a short learning curve, but you with your computer savvy would not have a learning curve at all. See you soon. Love your web site. I need to start one like this, too. Just so much to do and so little time! 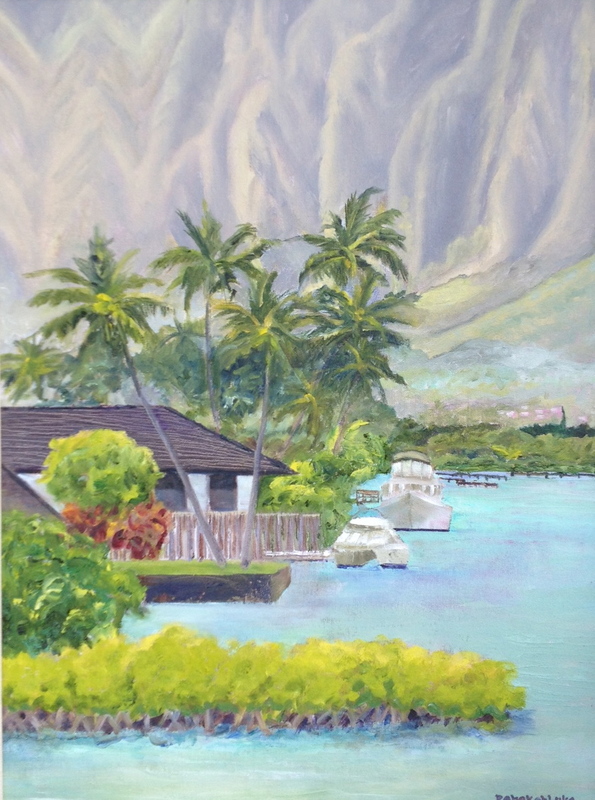 I gather from your invitation that you’re still painting at Ho’omaluhia on Thurs. Would you like to join us next Thursday at Kahana? Thank you for the lovely comments, Carole. I’m glad you could come to see the originals! See you at the beach! I invited myself last Friday to view Rebekah’s paintings in her home and she graciously served tea and rice cakes with Alice Brown nestled between us on the sofa while we talked. Her home is at the base of the Koolau mountains in Kaaawa yet a stone’s throw from the ocean and the incarnation of an artist’s dwelling, surrounded by Hawaiian exotic ti plants. 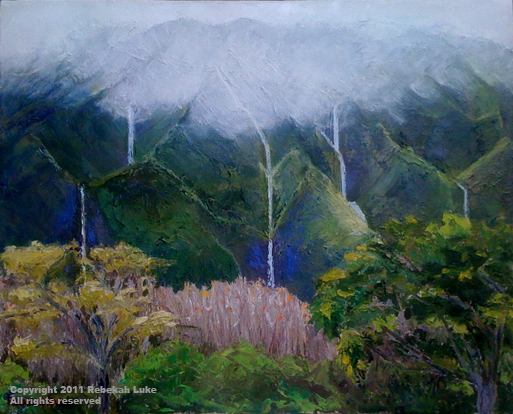 Her paintings were beautiful and my favorites were Rain Fantasy, Blue Koolau Mountains, and the Wild Orchid Faces; she has an impressionist’s touch reminiscent of I don’t know which artist of the movement; of course her style is unique and I will be saving my dollars for one of her works. She is truly une vrai artiste! I was attracted to the way the light made the tree in “Golden Retreat at Hoomaluhia” sparkle. Impressionism has to do with the essence of light and a style that is soft- rather than hard-edged. In my painting I used a palette knife instead of a brush. The result is an image that is not so exact, that is, just an impression! Glad you liked the porthole views of the Danube, a different perspective and already framed! My preference runs to the 2007 paintings. Is that impressionist style? I very much like the porthole photos. It’s a great way to see a part of what you experienced. Beautiful! Reminds me of the Hawaii I miss so much. Thanks for sharing. Will be in the area in November. Hope to see you then. Lovely paintings…your wonderful technique with oil paint makes your paintings look like water-colors….makes me want to see the originals…!!! Wonderful to see the marvelous facets of your life’s calling…Thanks for sharing…!!! Hi Mrs. Helwig! Think of you too. The picture you have with all the fruit is one of my earliest—Gloria Foss’s last studio assignment prior to heading into the field. It was challenging. I just finished another canvas with a pineapple. Waiting for the paint to dry before I put it on display. It’s a departure from my landscapes. Thanks for including me in your family for the Blog site. I will visit it often. We also have a picture of yours that hangs in our apartment Via Dot and Walter’s possession. It makes us think of you often. Thanks! I often paint scenes of where I think people might like to be. You and I have some of the same genes, and you are talented too! You have such a great talent. Your paintings are beautiful, they take me home. You are truly blessed. Thanking you for including me to share your blog. I enjoyed reading your posts and your pictures are lovely. Hope to see you at the Baby Luau if not sooner. Hi to all. Wow!! i really like your paintings! Thank you so much for taking the time to send your blog to me! I would love to see them in person; will see you soon at the beach avec les chiens!